The Ariane 5 rocket is seen here on its launch pad during the countdown. An Ariane 5 rocket roared out of its junglelaunch base Monday to put Arab and Asian commercial communications satellitesinto space, marking yet another successful ascent for the heavy-duty booster. Riding the combined power of twin solidrockets and a hydrogen-fueled main engine, the Ariane 5 lifted off at 2147 GMT(5:47 p.m. EDT) from the Guiana Space Center on the northeastern shore of SouthAmerica. The solids burned for just over two minutes,then peeled away as the core stage powered the rocket for anothersix-and-a-half minutes while soaring eastward across the Atlantic and climbingto space. Carrying two payloads that have interestingorigins, with one satellite waiting nearly a decade to fly and the otherordered as a replacement following a Russian launch accident, the Ariane'scryogenic upper stage performed a 14-minute firing to achieve the highlyelliptical target orbit. The ProtoStar 1 spacecraft was releasedfirst, followed by ejection of the rocket's dual payload attachment system andthen the BADR 6 satellite was successfully deployed. The satellites will be maneuvered intocircular geostationary orbits 22,300 miles above the equator where they canmatch Earth's rotation and appear parked over one spot of the globe. ProtoStar 1 is the first craft for thesatellite operator of the same name. With operations in San Francisco andSingapore, the company plans to operate spacecraft and lease the satellites'capacity to direct-to-home (DTH) television and broadband Internet serviceproviders across the Asia-Pacific region. Space Systems/Loral originally built thespacecraft in the 1990s for the China Telecommunications Broadcast SatelliteCorp. But U.S. export problems prevented the craft, then known as the Chinasat8, from being shipped to the Chinese launch base for a planned liftoff inmid-1999 aboard a Long March 3B rocket. A deal finalized two years ago between theChinasat Corp. and Protostar paved the way for the satellite to be launched andoperated by the startup company, and Loral performed some tailoredmodifications to the craft for the new owner. "ProtoStar allows its DTH serviceprovider customers to avoid allocating the large capital expenditureinvestments required to launch their own satellites and instead focus theirefforts on the business of DTH, namely with extensive efforts in programming, management,set-top-box procurement, subscriber retention, and ongoing customer care,"according the company's website. "It is through this mechanism thatProtoStar enables its customers to focus on their primary objective: growingtheir subscriber base." Companies already signed up to use ProtoStar1 include a division of DishTV India, PlanetSky of Cyprus and SingaporeTelecommunications. Headed for an orbital slot at 98.5 degreesEast longitude with an expected 15-year in-space life span, the satellite isfitted with 38 C-band and 16 Ku-band transponders. "This successful launch is truly therealization of a dream that began in 2002. That's when we first conceptualizedour business plan for a new constellation of satellites to meet the growingdemand for DTH television service throughout Asia," said Philip Father,ProtoStar's president and CEO. ProtoStar 2, a Boeing-built satellite, isplanned for launch next year. "Though we are already hard at work onthe ProtoStar 2 and 3 satellites, the excitement of getting our first birdsuccessfully into orbit is unrivaled. I'm sure I speak for all of our customersand partners when I say how thrilled we all are to have this first importantstep behind us," said Father. The BADR 6 spacecraft — which means"full moon" — will cover the Middle East and North Africa from 26degrees East to reach an audience of 130 million viewers from Morocco to thePersian Gulf. It will provide direct broadcasting and Internet services though20 C-band and 24 Ku-band transponders. The Arab Satellite CommunicationsOrganization ordered the craft in 2006 immediately after losing its Arabsat 4Aspacecraft in a Proton rocket launch failure. "BADR 6 is the second of Arabsat's 4thgeneration satellites that are considered to constitute a true milestone in itshistory since they are characterized by large capacities and high powerencompassing the whole Arab world, Africa and Western Asia as the base enablingits strategic rapid expansion of services provision," according to KhalidBalkhyour, Arabsat president and CEO. Built by Astrium using the final the Eurostar2000+ craft, it has a 15-year design life. The communications payload was madeby Thales Alenia Space. Monday's launch was the 184th for the Arianerocket family, the 40th for the Ariane 5 and fourth of the year. 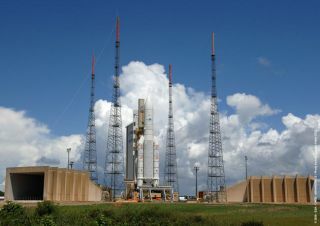 The next Ariane 5 launch is planned forAugust carrying the Japanese Superbird 7 communications satellite and theAmerican AMC 21 television broadcast spacecraft.